The pharaoh has got his revenge at last! I woke up feeling rotten this morning. I’ve been tired and lethargic for several days but today it all came to a head in a full-blown sickness. I’ve never been really sick in Egypt before and after ten visits I thought I was immune to ‘The Bug’. No such luck. By this afternoon I thought I was feeling a little better so Jenny and I went over to Luxor to change money and buy food. Not that I felt like eating anything. 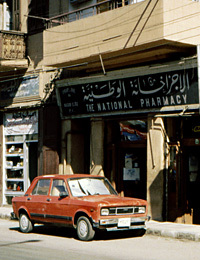 My main destination in the town was to the pharmacy to get some medicine for my rebelling stomach. Loaded up with pills and potions I went back to the flat to sleep. In the late afternoon our friend Ramadan stopped by with his two young children and invited us to go with them to the fair at Kom, another small village nearby. 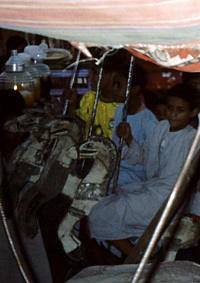 It was a local sheikh’s anniversary and there would be horse races and a funfair for the children. By this time I wasn’t feeling too bad and Jenny was keen to go, so we all piled into the taxi for the short journey to the village. Parking among the houses, we walked through narrow winding alleys to the edge of the village, where a field had been recently cut and a long straight race track was etched out in the stubble. There were a lot of horses milling about, white, black and every colour in between, some with riders and others tied loosely to a fence. When the next race started with a pistol shot there was a mad galloping of fairly reckless riders – it would seem that the object of the race was to ride the horses from start to finish by any means possible. It was great to watch the men in the hitched-up galabeyas tearing down the track while performing as many dare-devil stunts as they could for the entertainment of the crowd, while spectators shouted encouragement and cheered the fastest. It was very noisy. When we reached the fairground there was another cacophony of noise as a selection of loud scratchy pop music blasted out from many different loudspeakers. There were fairground rides for all ages, but the two children liked the ride-on horses best, sitting on top of the wooden painted ponies going round and round until I felt quite dizzy watching them. I had to admit that the various rides looked very precarious and I was sure that none of them would have passed any kind of health and safety checks in the UK, with planks loosely roped to wooden scaffolding and bits of metal wedged into spaces propping things up. It soon became obvious that foreigners and especially women, were a rare sight at these events and Jenny and I attracted quite a crowd of boisterous teenage boys who decided to follow us everywhere, shouting questions and improper suggestions. Still feeling under the weather I was definitely not in the mood for this. After a couple of hours we all left. By this time it was quite dark and the stalls were lit up with kerosene lamps and there were strings of bare light bulbs powered by a generator and threaded zig-zag fashion across the road. As we walked back to the car Aman and Mahmoud were both tired but happy and it had been a treat to see the fair through their excited eyes. We took our seats on the Aswan train leaving Cairo at 12.30am. We had bought first class tickets which cost an incredible LE60 (LE40 for me with my International Student Card discount). That’s only about £6.00 in English for a ten hour journey of 660km! 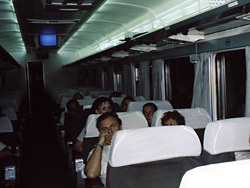 The spotlessly clean carriage was occupied mostly by Western tourists, but there were also one or two Egyptian businessmen, while most of the Egyptian families were travelling in the second or third class coaches. I was very impressed by the train. The seats were wide, comfortable and spacious, with reclining backs and they could even be swivelled around to face the opposite direction. It felt like business class on an aircraft. There were overhead video screens for entertainment, but I was thankful that nothing was playing as we hoped to get some sleep during the long journey south through the Nile Valley. Jenny and I both managed to doze after a while but the train was regularly speeding up then slowing down or stopping at stations along the route. There were plain clothes security men in our carriage, rather obvious in their grey suits with gun holsters bulging beneath their jackets. About once an hour a trolley containing food was pushed by and we could buy drinks and snacks or even airline-style meals on trays. After a few hours I visited the toilet at the end of the carriage, which made me decide it was not a good idea to eat or drink too much, as the floor was already swimming under about 15cm of dirty-looking water. However, this is my only criticism of my first long-distance train journey in Egypt. It’s a pity it was dark because the journey by day would have been much more interesting. The train speeded past a variety of countryside and through towns I had never visited, but by 6.00am the sun was already rising and we were able to look out of the windows and watch people going out into the fields with their animals to start their morning’s work. When we got to el-Balyana I recognised where we were because I have done this part of the journey by train before to Abydos and the terrain became more familiar. At Sohag a young man called Moutaz got on the train. He is a tour guide who Jenny had met before in Luxor and we passed the final few hours in interesting conversation with him, arriving at Luxor railway station at 10.30am. Our arrival time was actually 9.30am because the clocks had gone back an hour overnight from EST (which we hadn’t realised) but luckily the taxi we had arranged to take us to our West Bank apartment was waiting for us. Jenny and I both felt very tired but happy to be back in Luxor at last – a much more familiar place where I feel comfortable because I know how things work here. We crossed over the bridge to the West Bank and to the apartment at Kom Lolla which would be our home for the next 17 days. The owner was waiting for us with the key and showed us around. It’s very basic but large and airy and we both felt that we would be happy here. 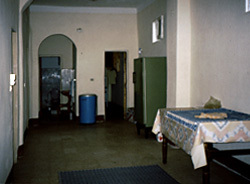 The double front door leads into a huge, high-ceilinged, open hall, with a table and chairs, a refrigerator and an old-fashioned boiler for washing clothes. There is a small kitchen with an ancient dubious-looking bottle-gas cooker and deep sink and a bathroom with shower that looked, well… adequate. Jenny and I chose our bedrooms from the three available, flung open the windows that looked out over a canal and agricultural fields towards the distant river and decided to get a few hours sleep. It seems so quiet and peaceful here after the chaotic city-life of Cairo. I woke up mid-afternoon to find that the apartment was full of mosquitoes. It hadn’t been such a good idea to leave the windows open, because the protective mesh screens that cover them are full of holes and the canal is obviously a breeding-ground for insects. We unpacked and showered and decided to get the ferry over to Luxor to change money and pick up some supplies. One of my priorities was a can of mosquito-killer and the other, a new pillow from the government shop because I hate the rock-hard bolster that is provided. I imagine it’s like sleeping on an ancient Egyptian head-rest. Even Luxor town seemed quiet and we didn’t see many tourists around, but maybe that was just because we’d come from the bustling metropolis. We had dinner at the Amoun restaurant and lingered with coffee into the evening over my favourite occupation – people-watching. It’s great to be ‘home’ in Luxor and before long all the problems of Cairo were fading into distant memory. Sitting quietly in the rooftop restaurant of the Ciao Hotel at breakfast this morning, by an open window enjoying the relatively clean air, high enough up for the petrol fumes not to reach us, Jenny and I were in a subdued mood. I knew that she was feeling the same about Cairo as I was and we had both had enough of the city. We had had our share of transport problems; the metro didn’t go anywhere we really wanted to visit and the thought of trying to take a bus to the monuments on the other side of the Nile was not an option we wanted to consider. By the third cup of coffee I had decided to make a telephone call to Luxor to see if the apartment we had arranged for next week was available early. We were in luck – the owner said we could have it tomorrow if we wanted and so our first port of call today was to the railway station to buy tickets on the earliest possible night train to Luxor. The concept of queuing does not seem to be understood in Egypt and the ticket office at Rameses station was a free-for-all, with whole families pushing and shoving their way to the front, but after asserting ourselves with our elbows we finally arrived at the front and managed to secure tickets for tonight. With the tickets in my hand, my spirits instantly lifted. Walking out to the front of the railway station we went to visit Rameses the Great, whose colossal statue, twin to the reclining statue I had seen at Memphis, stands in the centre of Midan Rameses, surrounded by scaffolding and waiting taxis, looking very neglected and forlorn. It is rumoured that he is to be moved to a better environment away from the damaging pollution of the city traffic. Next we went down into the Metro station to have a look at the map and found that we could travel on the Metro almost to Tahrir Square and the Egyptian Museum. It was only three stations away. It took us a while to find the right platform, taking many wrong turns down long stiflingly hot tunnels that all looked the same, hindered by the fact that all the signs were only in Arabic. Jenny and I bought our tickets and had only a few minutes wait for the train. The crowded carriage was full of men, who watched us with interest and it wasn’t until later I realised that there are separate carriages reserved for women only. The journey lasted 15 minutes and getting off the train at Sadat Metro station, we found our way back to ground level and walked the short distance to Midan Tahrir and the Egyptian Museum. The Cairo Metro was a new experience for me, having only travelled on the Paris Metro before many years ago, and I was very impressed by the cleanliness of the stations here. It certainly felt easier than dealing with the taxi drivers again. Spending several hours in the museum we saw many more of the galleries than we had had time for on Monday. It was very crowded this morning with tour groups whose guides were shouting above the noise of other tour guides and competing for space around the most of the major exhibits. The noise was deafening, echoing off the high roof of the atrium, but by lunchtime the museum had become less chaotic and there was even an hour or so in the early afternoon when it became quite empty and I was able to take photographs. 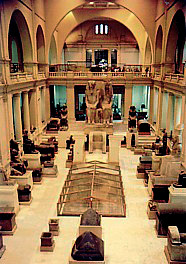 The time passed very quickly for us, lost as we were in the wonderful works of art there, especially in the Amarna gallery, with its fabulous colossal statue of Akhenaten. Coming out into the dazzling late afternoon sun, we wandered for a while around the garden, where there are many interesting pieces of statuary scattered along its paths, before risking a taxi back to our hotel to pack and get something to eat. We had plenty of time and had dinner in the hotel restaurant that was beginning to fill up for the evening. The restaurant seems to be a popular place for Cairenes to spend the evening. We didn’t need to be at the railway station until Midnight, so Jenny and I took a little stroll around the local streets, noisy and vibrant with city night-life, to say goodbye to Cairo. I’ll be back one day, but for now I was looking forward to being in Luxor again, my second home. I had forgotten that today was the beginning of the three-day Muslim feast of Eid el-Adha, the Feast of Sacrifice that commemorates the prophet Abraham’s willingness to sacrifice his son Isaac to God and the conclusion of the pilgrimage to Mecca for those lucky or devout enough to go on Haj. Last year I was present at this feast in Abydos with my friend Robin, when both the surroundings and the occasion had been a very special and memorable time for me. Jenny and I realised what day it was as soon as we were out on Sharia el-Mahatta (Station Street) this morning. The street was strewn with colourful bunting and banners in green, red and blue, criss-crossing haphazardly over the road like Buddhist prayer flags fluttering in the strong breeze. Traffic was at a standstill with crowds of people milling everywhere on the street; women and children in their best clothes dressed for this holiday which is the most important feast of the Islamic calendar. Food and juice stalls lined the road and barrows full of holiday toys and trinkets attracted crowds of children like bees to honey. Horse races and parades through the streets of Luxor are a special feature of the Feast. In front of the Railway station there were many beautiful horses, standing proud in their elaborately decorated saddles, with plaited manes and brushed tails. There were donkeys loaded up with children parading up and down, looking like seaside donkey rides on an English beach. Everyone seemed to be having a great time. Loud music was coming from every shop doorway. As we reached the end of Sharia el-Mahatta we met ‘Mr Happy T-shirt’ (our nick-name for this character) who is usually only at his post near the old Luxor Hotel in the evening. Every night when we pass him he rushes up with a handful of T-shirts for sale and starts talking excitedly in broken English, a patter so fast that it’s difficult to keep up with him. We often stop to chat and I’ve never known him to stop grinning. The fact that he was here this morning is an indication of how important this day must be for the street traders. We called in to say hello to Ibrahim who was looking after his brother’s jewellery shop today and were invited to help him eat the massive special lunch his mother had sent to the shop from his home. It was just like Christmas Day without the snow and I had the feeling of being caught up in the moment, like when you go to a fairground and catch the distant echoes of a long-forgotten childhood excitement. Later in the afternoon we caught the ferry over to the West Bank. Salah had offered to take us to Malqata to watch the sun setting behind the Theban Mountain and witness the desert turning gold. I love Malqata, especially in the evening and try to visit it at least once while I’m in Luxor. 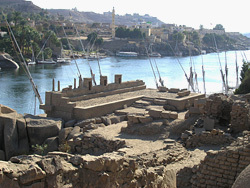 This is the site of the palace and town of Amenhotep III. Jenny, Salah and I walked from Medinet Habu, through the back-lanes and fields and out into the desert to the French excavation house. When we arrived there was still enough light to take a few photographs of the palace area before walking a little way out into the desert towards the mountains, but the khamseen wind had grown stronger and there was a lot of sand in the air. The French archaeologists were not in residence at present so we went and had mint tea with the French-house gafir, who remembers me from previous visits and is always very welcoming. As the darkness crept in, it was hard to remember that we were only a short distance from Medinet Habu and the village of Kom Lolla. It feels so isolated and remote at Malqata in the evening, with only the swishing sound of the wind in the bushes around the courtyard garden and the distant lonely barking of a dog in a far-off cluster of houses to disturb the peace. And above us as always, the first sprinkling of stars in a deep deep velvet sky. It was quite a shock arriving back in Luxor late at night with the crowds still wandering up and down the Corniche and the town just as noisy as when we had left it. I am writing this back in our room at the New Radwan Hotel and looking out from our balcony onto the minaret of the little mosque next door. The tall tower is floodlit and the mosque is decorated with strings of lights, prettily lit up like a Christmas tree for the holiday. At midnight the noise is still going on with music and car-horns piercing the night and it looks like we will get little sleep. Quite a contrast to the peace and solitude of the West Bank where there was little evidence of the Feast at all. Jenny, who has a degree in Zoology, loves creatures of any sort and to my utmost horror, had persuaded Ibrahim to take us to see the snake charmer at his home in Luxor. Snakes come a close second to spiders in my list of phobias, so I’m not sure how I got talked into this, except that I’m always open to new experiences in Egypt. Well, most of them! Ibrahim collected us from our hotel this morning and we went by taxi to a village on the eastern outskirts of Luxor. I really wasn’t sure what to expect when we left the taxi and began walking through the narrow streets of the village, along a narrow dirt road which ran between small mud-brick houses. The people who lived here obviously didn’t see many foreigners and from every doorway someone was peering out to catch a glimpse of us. We were followed at a distance by a crowd of raggedy children, not quite brave enough to approach us but curious enough to follow to see where we were going. Eventually we arrived at a very poor-looking house in the heart of the village and Ibrahim knocked on the open door. The snake-man could not have been more welcoming and seemed delighted that we should visit him here. We were ushered into the house, which seemed to consist of only two rooms, one where the family all slept and another opening off the street and where we were seated on long wooden benches. The snake-man didn’t speak English so Ibrahim acted as interpreter. This man is one of the snake-charmers who go around the hotels and cruiseboats entertaining tourists with his basket and flute and although I don’t like snakes, these men always have held a sort of fascination for me. After we were brought glasses of tea and when the formalities were over, he brought out several small woven ‘Ali-Baba’ baskets. Placing the first basket in front of us he took off the lid and put his hand in to pull out a tangle of several cobras. I shivered and moved away horrified as he offered the writhing mass of bodies for me to hold. Jenny, much braver than I, took one of the snakes and sat gently stroking it on her lap as the snake-man, with Ibrahim interpreting, began talking about his cobras. The first thing he mentioned was that these snakes’ teeth had been removed – though he didn’t say how this was done and I thought it must be cruel. Cobras are among the most poisonous snakes here in Egypt with long hollow fangs in the upper jaw that can lock onto its prey and inject poison from its venom sacs like liquid from a hypodermic needle. A victim bitten by a cobra could be dead within a few hours. The snake-man does not catch the snakes himself, but buys them at great expense from a professional snake-catcher. He told us that because of their value, he takes great care of them. The fangs are removed after the snake has fed and it can go several weeks without needing to feed again. The teeth re-grow in a few days and I wondered at what stage of re-growth these snakes teeth were at. Just in case, I kept my distance, but Jenny was mesmerised by these glossy slithering reptiles. After a while the snake-man’s little son, a toddler, came out from the other room and picked up one of the snakes, shaking it around and holding it close to his face. It would seem that this is a family business. In Egypt, snake charming is a very old form of entertainment. Cobras are the most popular snake used and as the charmer plays his pipes, the cobra rises from its basket and coiled in the recognisable upright posture, spreads its hood, ready to strike. The snake reacts to the movement of the charmer’s pipe, hypnotised and moving back and forth, looking like it is dancing to the music. While this was all very interesting, I did not enjoy the visit. However much I dislike snakes, I don’t like to see creatures kept in captivity and I was sure that it couldn’t be humane to keep the snakes like this purely for the entertainment of tourists. Jenny however, with a much more scientific viewpoint, enjoyed meeting the snake-man and his cobras. I guess these people have to earn a living somehow. While we were out and about in Luxor a few days ago, Jenny and I met a girl who was staying in a hotel called the Nefertiti, which she said was cheap and quite good. Always on the lookout for decent budget hotels, this morning we went to investigate. The Nefertiti is somewhere down one of the little side streets in the area around the suq and it took us a while to find it. We had a look around and were shown into a couple of the rooms, which were cramped but adequate (I’m being kind here) and probably about the standard one would expect for EL15 (£1.50) a night for a double room. After thanking the hotel manager for showing us around we decided to go up onto the roof for a cup of coffee. There seemed to be quite a lot of floors and as we climbed and climbed up the dark winding staircase to the top of the building, Jenny and I decided that the hotel was not for us. For a start we guessed that it would be very noisy being in the position it was in. Hot and breathless we slumped into a couple of cane chairs and ordered our coffee which turned out to be a cup of warm water and a packet of powdered Nescafe (another black mark). Then I turned around to look over the wall. The whole of Luxor Temple was laid out before us in all its glory in a vista which must be practically unique. We could see right down into the open courtyards and onto the roofs of the chambers – what an amazing view! I gave the hotel a gold star just for that view. A young friend of mine, Ibrahim, has been trying to teach me Arabic for the past couple of years. His own grasp of English is excellent and we will occasionally spend an hour or two together when he will give me lists of words and phrases to memorise and then test me on them at a later date. Gradually my knowledge of the language is increasing little by little so that I am able to understand conversations and even contribute now and then. People I meet who don’t know me are often quite impressed by my command of Arabic (which is mostly total bluff!). Today Ibrahim’s mother, Hyat, had invited Jenny and I to lunch at the family home near Karnak and Ibrahim came to our hotel to collect us and take us there in a taxi. Their pretty house is quite large and the brightly painted front door is reached through a little garden. When we arrived we were welcomed by Ibrahim’s mother, who everyone calls Haga, a title of respect as she’s made the pilgrimage to Mecca. We were also introduced to his younger sister Sayla who was just as welcoming though a little shy. In the reception room we were brought a tray of tea and we all chatted for a while before being shown over the rest of the house, right up onto the roof that has a lovely view over to Karnak Temple and where the family’s chickens are kept. Afterwards, Haga provided a superb meal of traditional Egyptian dishes and Jenny and I both felt we had eaten far to much by the time we left. What a lovely family. Being so close to Karnak, Jenny and I decided to walk over there for a quick look around. I had forgotten that the entrance route has been recently changed and part of the surrounding land fenced off which meant quite a long hike around to the front of the temple. It was mid-afternoon and a perfect time to have a look at the reliefs on the Third Pylon as the light was just right to show them at their best. These reliefs are very shallow and it is sometimes difficult to pick out detail, but today they looked very good and I took several photographs of the Barque of Amenhotep III with what is believed to be a tiny figure of the future Amenhotep IV (Akhenaten). After looking around the rest of the Sanctuary area the crowds were beginning to thicken, so we left Karnak to take a taxi back to our hotel.